FROM JULY 5TH TO AUGUST 26TH!!! Join us for the best experience your child can have. It’s time to make new friends or find there old ones. 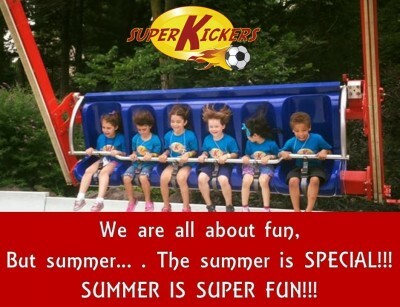 Super Kickers main motto is always make it happen for the kids, be fun! However, this time of the year we are specially happy since we can go on trips, play outside. Sprinklers, Water Slide and Roller Blade lessons are among many activities that we proud to have the best team working with the kids. FROM 9:00 AM TO 5:00 PM!!! We also have early drops and late pick ups. YOU CAN MAKE YOUR OWN SCHEDULE!!! PICK THE DAYS ARE BEST FOR YOU! You get the best price for a quality program, approved by New York City Department of Health and Mental Hygiene. We provide 6 daily Trips for ages 5 and up during the Summer Camp. Trips are always on Wednesdays and require a separate registration. REGISTRATION OPEN UNTIL MAY 31ST!!! LIMITED SPOTS AVAILABLE FOR SOME GRADES!!! SUMMER CAMP OPEN HOUSE MARCH 30th in PORTUGUESE! Come to meet the owner, the camp location and ask questions.